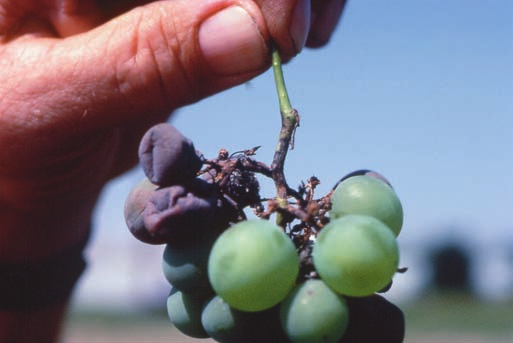 Phomopsis cane and leaf spot is a grape fungal disease caused by fungi Phomopsis viticola. 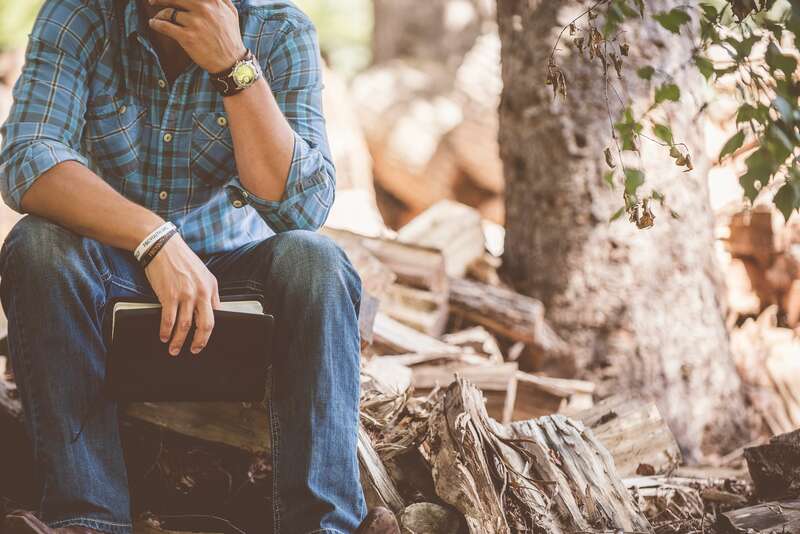 In the past, the diseas was known under the name »dead-arm«, but in 1976, researchers have found out that these are actually two different diseases that often occur simultaneously (Phomopsis cane&leaf spot and Eutypa dieback). Phomopsis cane and leaf spot is widely recognized in all grape growing regions around the world. 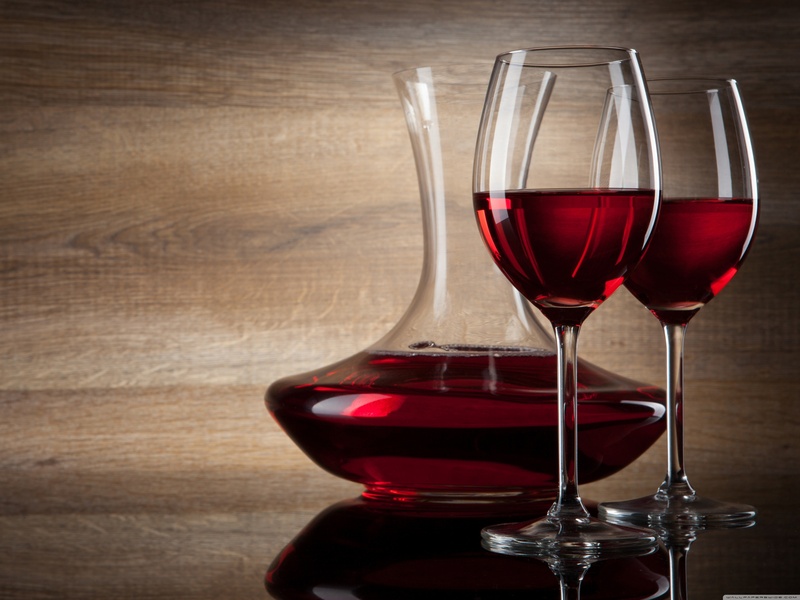 Cool wet weather increases the possibility of Phomopsis development, which then reduce the quality and quantity of grapes and weakens the vines. 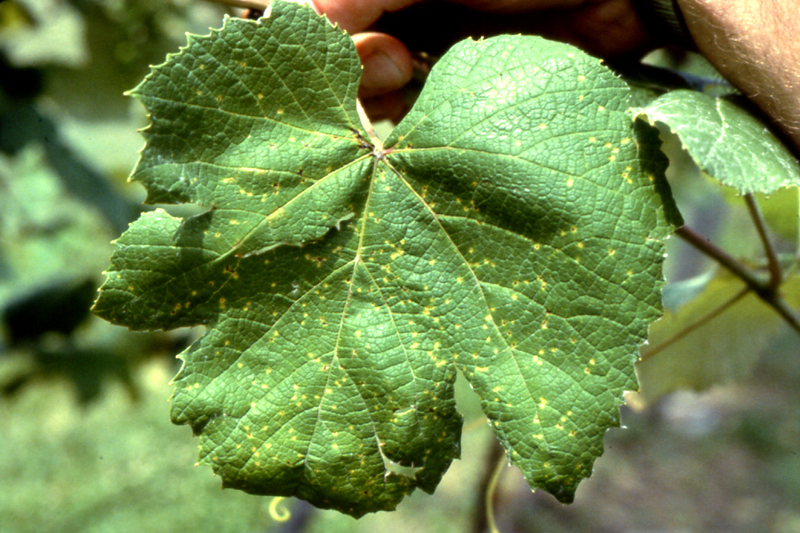 Phomopsis can infect most parts of the grapevine; the most common symptoms appear on the shoots and leaves. On leaves symptoms of infection first appear as small light-green spots, on the lower leaves of the shoots. Eventually, spots enlarge and turn black with a yellow margin. If too many lesions develop on one leaf, the leaf will turn yellow and fall off. On shoots disease symptoms appear as small spots with black centers, which can later grow together and form irregular, crusty areas. Similar black spots can also develop on flower cluster and causes breaking. Phomopsis can infect berries through the whole growing season. Symptoms of the infection are not visible until close to the harvest. That time infected berries start to rot – they become light brown and in the end shrivel – when spores break through the berry skin. Fungus Phomopsis viticola overwinters in the infected woody parts of the vine. 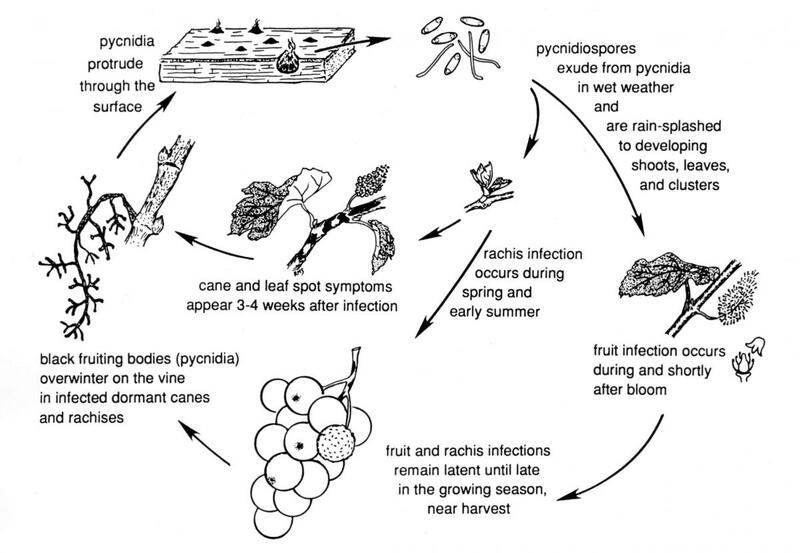 In the spring, when there is a lot of rain fungus fruiting, bodies called pycnidia, release infected areas. Then they are splashed to young shoots, leaves and clusters with rain. Fungus infection depends on wetness duration and temperature (1-32°C). The possibility of infection increase when there is 100% relative humidity and optimal temperature of 23°C. Symptoms of Phomopsis cane and leaf spots infection on canes appear 21 to 30 days after the infection, and 7-10 days after the infection on the leaves. Wet weather conditions increase the possibility of infection, on the other hand dry and warm summer weather seems to deactivate fungus. Since Phomopsis needs at least 6 hours of wetness duration for its development, careful selection of planting sites, good soil drainage, and good air circulation should be ensured. 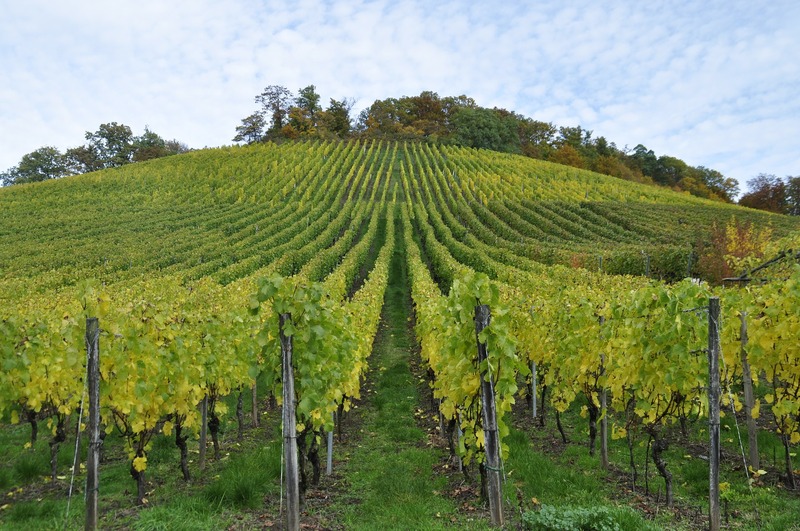 In case there are vines that were infected in the previous season, all infected canes and cluster stems have to be cut out and destroyed during the pruning. For chemical control of the Phomopsis cane and leaf spots, it is essential to know the proper timing (early in the season) of fungicide spraying. And eVineyard can help you with that, so you will never miss the right moment again! 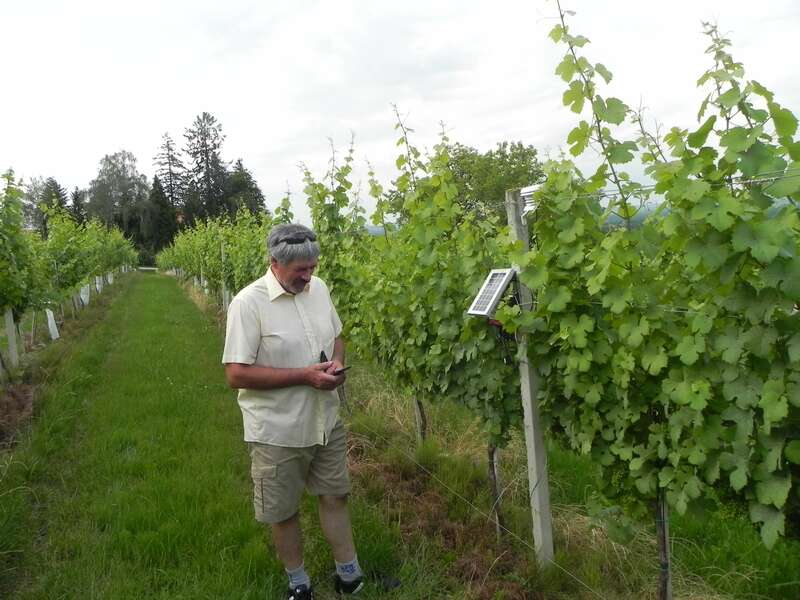 Winegrowers how are you protecting your vines from Phomopsis cane and leaf spots infection? Let us know in a comment below! If Phomopsis starts to show, would you cut the clusters and leaves affected so that it won’t spread? What about black rot? Black rot is also showing up o cluster in late June. Plenty of air space and sun that I am confused as to how this could happen. Last fall and winter pruning I did a thorough job of removal of everything and destroyed. Hello Barry, I am very sorry I have missed your comment, so my answer is coming a bit late, but still. So yes removing the affected clusters, canes, and leaves can reduce the disease severity. For Black rot basically, the same management practices are recommended – sanitation and good air circulation in combination with fungicides application. 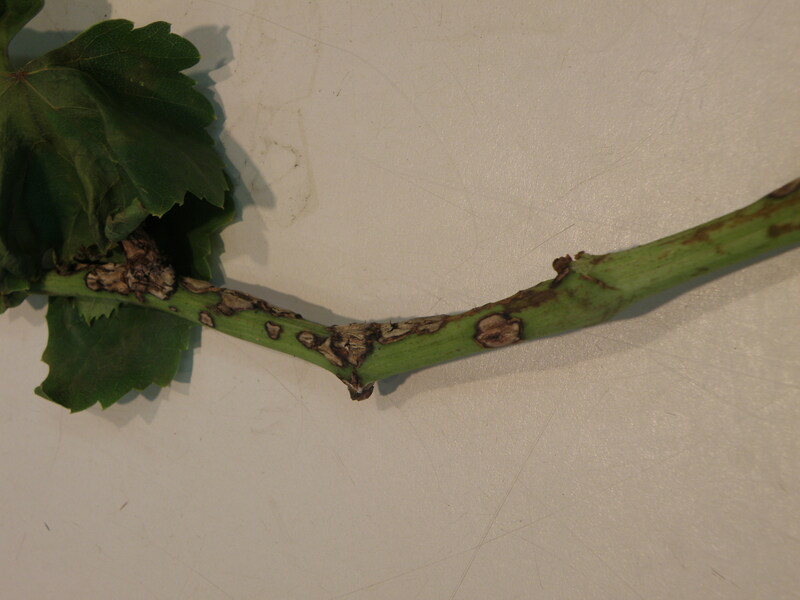 You can learn more about Black rot disease and management here. Air circulation and sun exposure can be achieved with good canopy management practices during the growing season, such as shoot positioning and leaf pruning. I have also written about the benefits of cluster zone leaf removal, please see here.